Hikers and mountain bikers have replaced cowboys and cattle calls at Joseph D. Grant County Park, the largest park in the Santa Clara County system. Driving directions: From Interstate 680, take Alum Rock Avenue eastbound in San Jose, and turn right onto Mount Hamilton Road. Go eight miles to the park entrance. Often called Grant Ranch in honor of Joseph Grant, who once owned this vast, mountainous tract east of San Jose, the park still has plentiful reminders of its ranching heritage: old windmills, rusty barbed-wire fences, ponds to store drinking water for thirsty bovines. Most of Grant’s 50-plus miles of trails are dusty roads from the ranching era, many steep enough to convey the advantages of horse-powered travel. The rewards of enduring Grant’s hills include colorful wildflower displays in mid-spring and an entertaining chorus of birdcalls throughout the year. Standard precautions: Dress in layers — it can be windy on the ridges and cool in the valleys. Wear sunscreen — shade is rare on Grant’s trails. Watch for ticks in grassy areas and rattlesnakes in rocky areas; both are more active in the springtime. Moderate: One of the best wildflower walks starts out from the Twin Gates trail head, about 3.3 miles beyond the main entrance on Mount Hamilton Road, and heads north along the high, open country of the Cañada de Pala Trail. Options abound for hikes of up to eight miles. 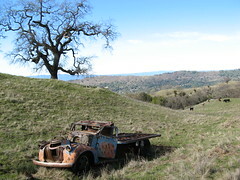 Hard: Washburn Trail, about a mile north of the Grant Lake parking lot, features one of the Bay Area’s meanest grades. Combine it with a trek down Cañada de Pala Trail to Twin Gates, cross Mount Hamilton Road, take Bonhoff Trail to Foothill Trail, pause at Eagle Lake, then head down the Hotel Trail to the Ranch House and back over to Grant Lake for 13 rigorous miles.